Much has been said and written about Howard Shore’s use of the Wagnerian concept of leitmotif (literally ‘leading motive’) in his score for LOTR. Briefly, the idea is that the composer represents the important elements of the story — characters, objects, ideas — as musical themes or motives in the score, and then uses these themes to expand and comment on the developing action. Although it is by no means new to film-making, the use of leitmotif is extremely rare in films these days. The reason? Simply put, time. It takes time to develop themes on film, just as in book terms it takes many pages to develop plots, arcs and characters. Shore was particularly lucky to have 9 hours (or nearer 11 as far as the extended DVD editions are concerned) in which to fully make use of the leitmotif idea in the LOTR films. The only comparable composer in blockbuster Hollywood terms is John Williams, who similarly had over 6 hours to play with in each of the Star Wars trilogies. Even Williams, legendary composer though he is, was not as successful as Shore in his treatment of the LOTR trilogy. Returning to the extended DVD editions of Jackson’s films, they are a useful source of information on Shore’s Wagnerian treatment of the film score. Several major themes can be identified over the course of the film trilogy. The signature theme in the Fellowship of the Ring is probably the ‘Shire’ theme. It represents the Shire and home, of course, and occurs a great many times, whenever the Shire is mentioned or one of the hobbits talks of going home. It is often rendered in a folksy, slightly out-of-tune ‘penny-whistle’ flute version. It is warm-hearted, comforting and inviting, much like the Methodist hymn This Is My Father’s World, to which it bears a remarkable similarity. The hymn comparison is perhaps most apropos given that Shore is attempting to evoke the pastoral idyll of a pre-industrial age. Perhaps equally important in FOTR, however, is the ‘Fellowship’ theme, which is also almost certainly the most repeated theme throughout the trilogy as a whole. Where the ‘Shire’ theme is placid and soothing, ‘Fellowship’ is heroic, jagged and assertive. There are also many variants on the theme – tentative when we first hear it as Sam stands in a cornfield in the Shire, triumphant following the Council of Elrond, and finally mournful with the deaths of Gandalf the Grey and Boromir and the breaking of the Fellowship. The ‘Rohan’ theme, which we only hear for the first time in the Two Towers and is not present in FOTR at all, is my own personal favourite in the entire trilogy. It somehow manages to convey in just a few notes the essentials of Rohan culture: simplicity, military prowess and a deep sense of honour. It also showcases Shore’s genius at coming up with musical ideas that impart a sense of culture and place. In this respect, the realisation of the ‘Rohan’ theme on the Norwegian hardinger fiddle is an absolute masterstroke. Its haunting tones are perfectly suited to evoking the noble barbarian past and with its Scandinavian origins it is also a cultural match for the Anglo-Saxon-inspired Rohirrim. Whilst the ‘Gondor’ theme might not appear to be quite as unique and catchy as that of Rohan, it is equally appropriate for the more formal and regal culture of the heirs of Numenor. One could imagine it being used for a coronation (as indeed it is!). There are numerous other minor themes in the three Rings films but limitations of space mean that I’ve restricted my comments to the four main ones set out above. 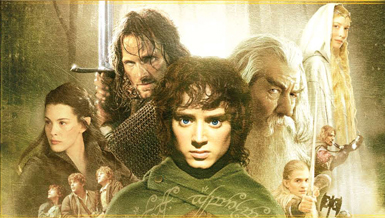 However, the creation of epic over-arching themes is only a small part of Shore’s achievements with the LOTR score. Just thinking about the “Shire” and “Fellowship” themes brought a smile to my face. Shore’s score had a large part to play in taking the LOTR films to the level they reached — and have made the “Hobbit” trailer one I’m happy to listen to over and again! Love the LOTR soundtrack although strangely it doesn’t work for me as writing music. Maybe all the different themes are a little too jarring to the creative process. If I remember correctly, the Der Rings des Nibelungen was composed by Wagner and that was based on the German epic poem The Nibelungenlied which was a probable basis for the idea of Tolkien’s ring being lost in a river which he surely came across when doing his studies. His music has been featured several times on a program my local classical station, KQAC (online at allclassical.org) produces, called “The Score”. It airs Saturdays and Sundays, and is all about film music. Sorry if this is the wrong place for this but I didn’t know where else to put it.